Weather Underground posted a story about the effects of the heavy rain on the water level of Lake Okeechobee today. It describes how rain from Hurricane Irma brought the water level up to over 16 feet above sea level. They can only remove about a quarter inch of water from the lake every day through normal operations. If the water level goes above 18.5 feet, there is a fairly high probability of the dike that contains the lake will fail, dumping floodwaters onto communities and farms downstream. And the tropical storm season still has two months to go. Could it be another weather-related disaster this year? Only time will tell. You can read more about it at https://www.wunderground.com/cat6/lake-okeechobee-nears-highest-water-level-10-years?__prclt=DU7ssy0G. 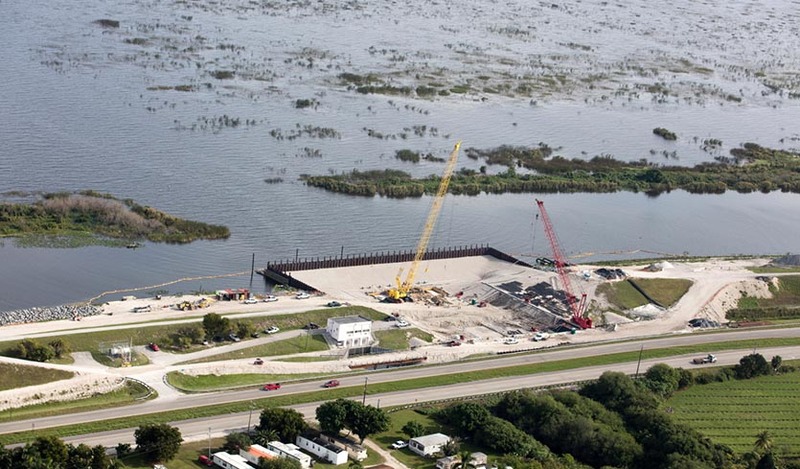 With Lake Okeechobee in the background, crews work to replace a water control structure, or “culvert” in Herbert Hoover Dike along Highway 27 near Clewiston on December 23, 2015. The culvert replacements include installation of a temporary cofferdam to hold back water while crews work on the earthen structure. Image credit: USACE.